When it comes to sports’ influence on what we wear, often a sport moves on but the broader sportswear stays the same. The only barriers are the colossal amount of time and money golf requires, my allergy to country clubs, and the state of golf-wear, which is entirely intolerable. Like many sports, golf has had tremendous influence on men’s fashion, but the clothes the actual athletes wear bear little resemblance to the clothes that have trickled into everyday men’s style. 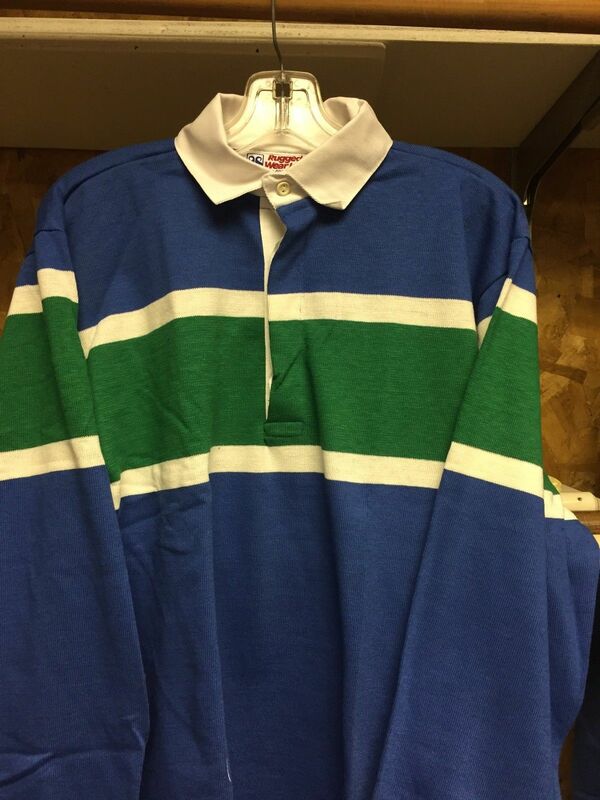 Like the cotton pique golf shirt, which can be great. But pro golfers today (and amateurs who’d emulate them) wear terrible, shiny, performance fabric shirts and are generally walking billboards for their sponsors. 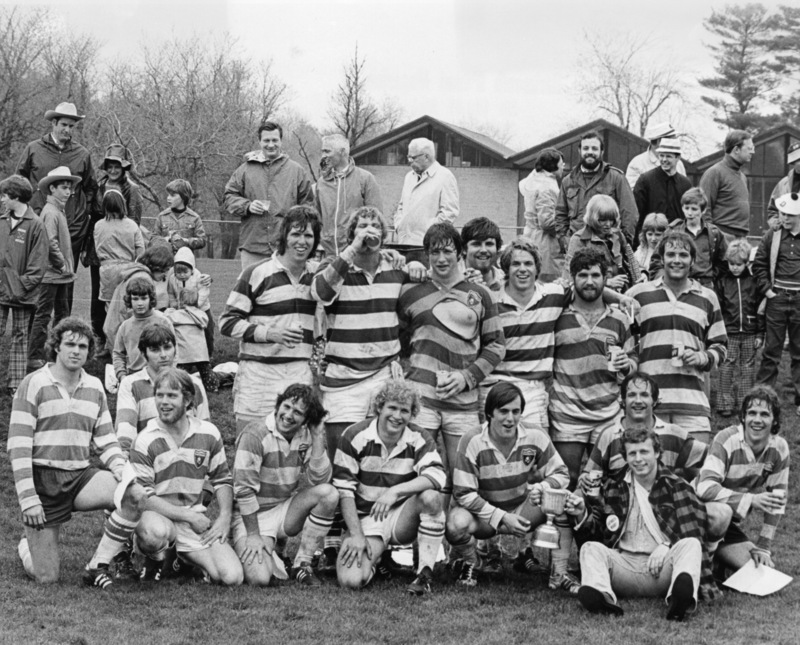 Likewise, rugby players today wear jerseys that pay little homage to the classic, cotton, collared rugby shirt. They’re polyester/synthetic, tight (to avoid being tackled by your jersey), sometimes with a semblance of placket, and sometimes with patches to help grip the ball better. The classic cotton rugby, however, persists — witness the articles in men’s magazines every year heralding its comeback. I mean, we’ve endorsed rugbies at Put This On multiple times, and at least since at least 2009. It’s 2018, How Are We Wearing Our Rugby Shirts? “Collegiate” color combos–plain or horizontal “hoop” stripes in burgundy/gray, navy/white, etc. Additional features, most of which I used to avoid, were embroidered crests, chest patches, and numbered patches on the back to imitate field-worn jerseys. These days, I’m more aware of other subtle/subcultural associations for rugbies. David Hockey’s art dude rugbies. 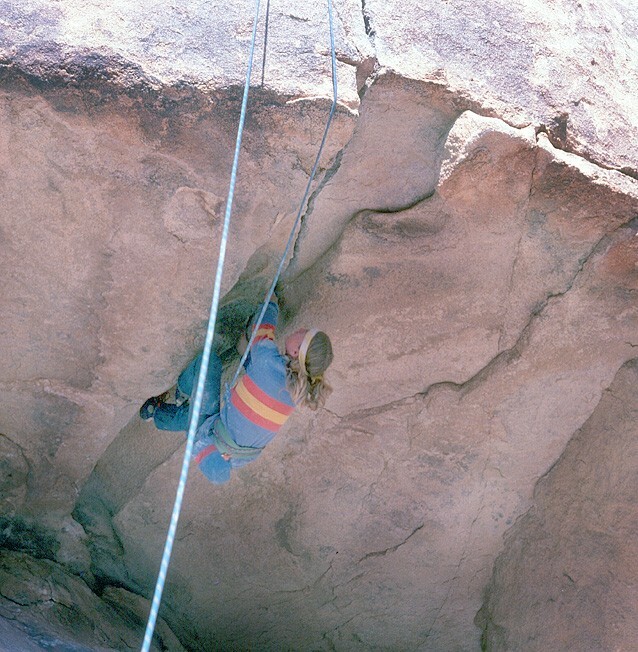 70s rock climbing rugbies, allegedly rooted in Yvon Chouinard figuring out the collar held up well when carrying rope (these remain some of my favorites). Italian Paninari and their penchant for Benettons (See also Andrew Luecke and Greg Foley’s book, Cool). And 90s hip hop culture, influenced in part by Polo’s sporty 90s aesthetic, and made the rugby a basic unit of classic streetwear. 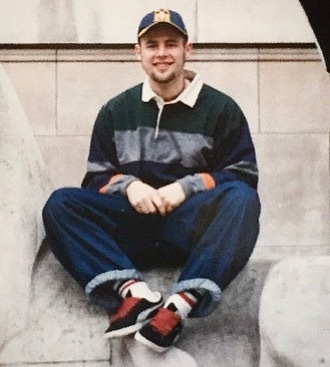 Anthony today vs 1992 or so. 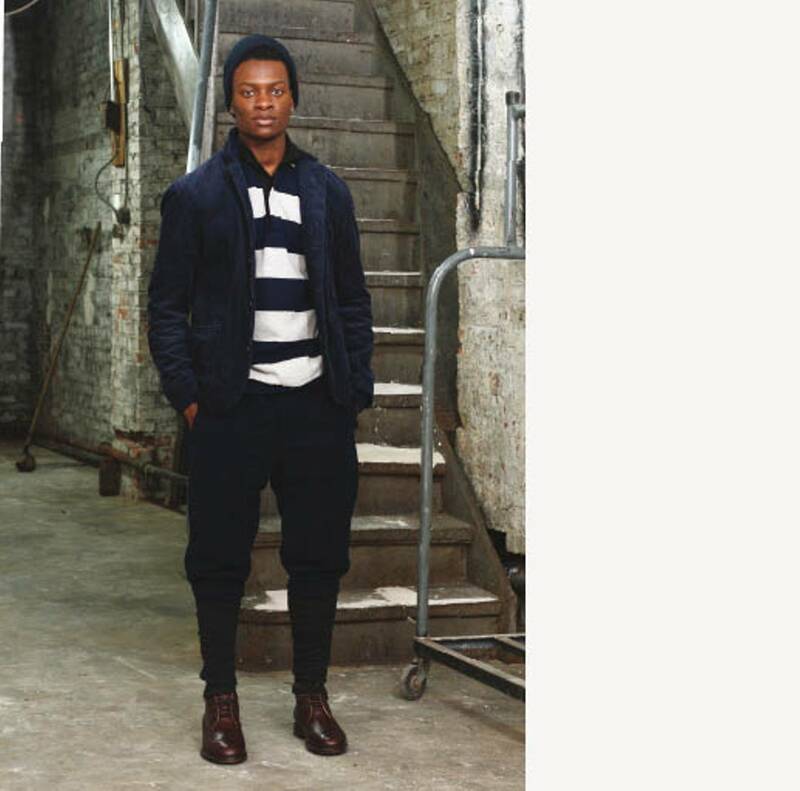 I still tend to wear mine un-layered, with jean or trouser-cut corduroys or khakis–less often with jeans. They’re also a great choice for the very short but enjoyable shoulder seasons when the long-sleeve-shirt/shorts combo is viable. Whether there’s a prep/Ivy resurgence or not, there are a lot of new rugby shirts out there right now, at any price you’d like to pay. 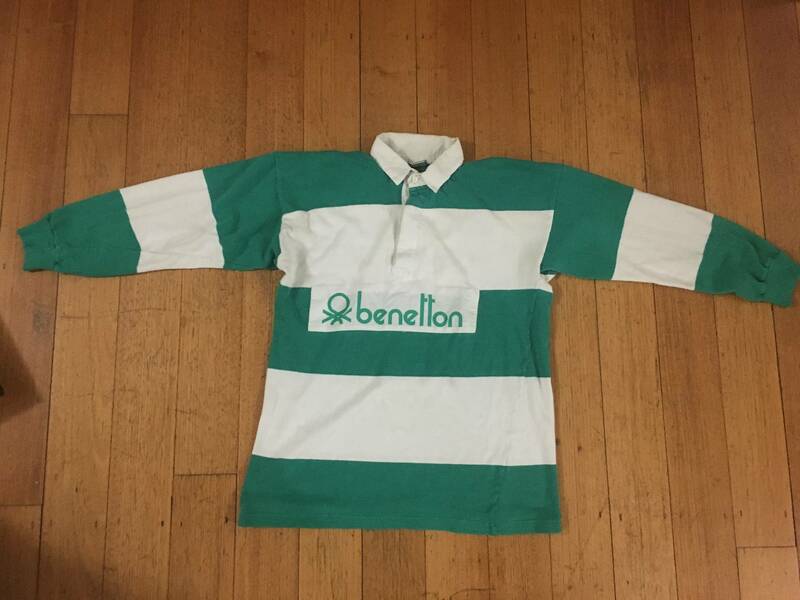 Under $100, you can still buy rugby shirts from L.L. Bean or Land’s End in similar designs to what they’ve been doing since the 1980s or longer. I must admit, while I like Bean’s logo, I don’t want it on my rugby shirt. A lot of 1980s versions were made by Columbia Knit, who still makes a quality shirt at a nice price, in the U.S., while most of the other companies have since outsourced production. J. Crew has nostalgia-nodding rugby shirts these days as well. 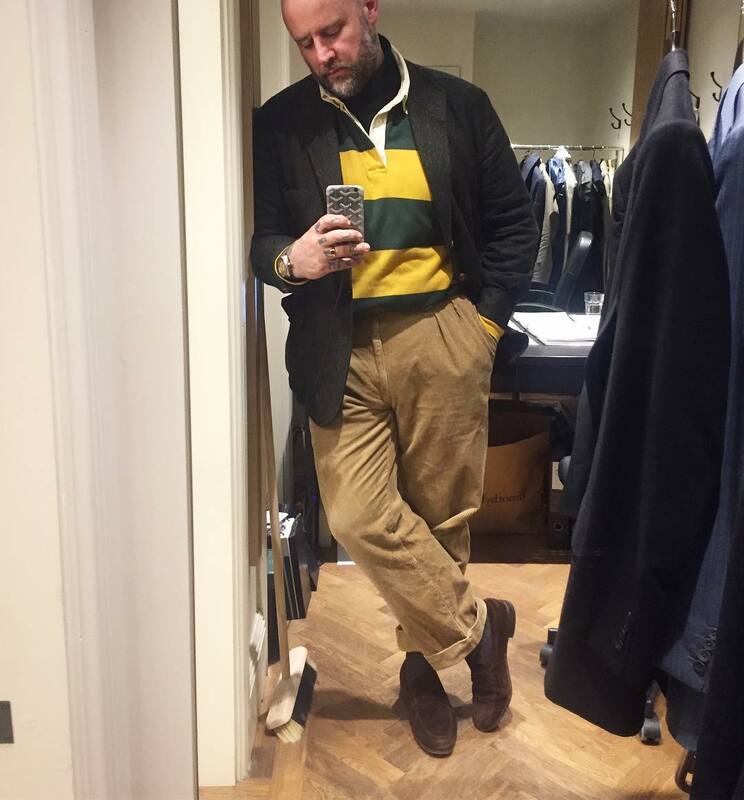 A solid argument can be made that you don’t need to get fancier than these–the rugby is a basic cotton layer and more design or nicer fabrics don’t improve on the basic idea. Companies like Rowing Blazers are trying, however. At $185, their French-made rugby shirts are, for the most part, heavier than the basic versions above. I have one and found its 14 oz. cotton nicely replaces a sweatshirt-weight layer. Many of their designs involve interesting embroidery or different collar styles–I gravitate toward the basic. Another prep-riffing brand, Noah, has collaborated with RB as well as making their own rugbies–both the collaboration and Noah mainline rugbies are made in Canada and their fabric is a little lighter at 8 oz. 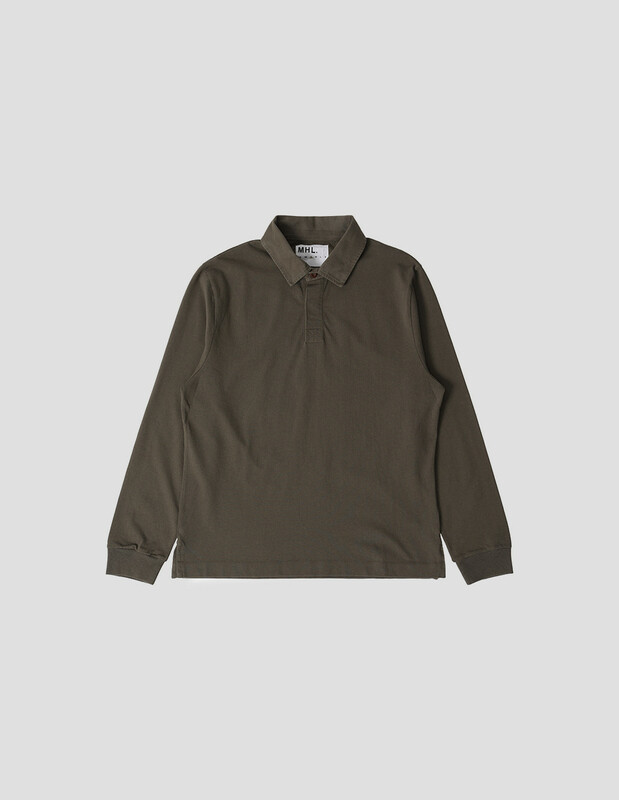 Margaret Howell has a typically stripped-down, earth tone version this year for $150. Ralph Lauren, which used to have an entire line named after rugby (the sport? or the shirt?) 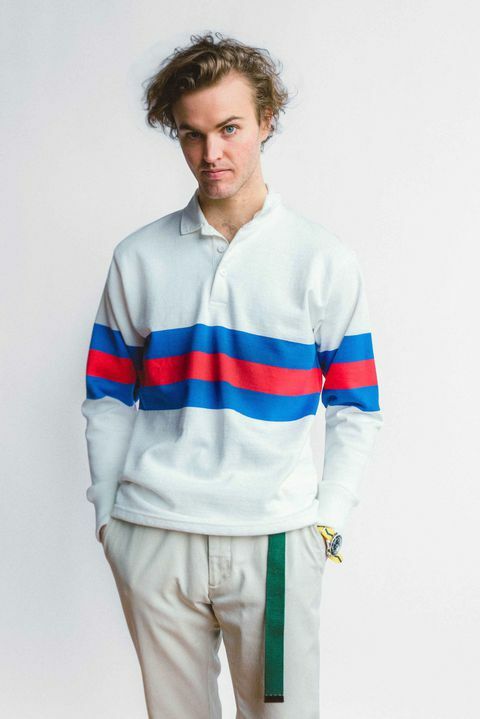 still has a classic polo-player embroidered model (a little fratty, maybe, even for me) for about $100, and some fancier 90s-sport styles this year at closer to $200. At over $200, you’ll find designs that either lean on luxury or gimmickry. RRL makes a faded indigo rugby. 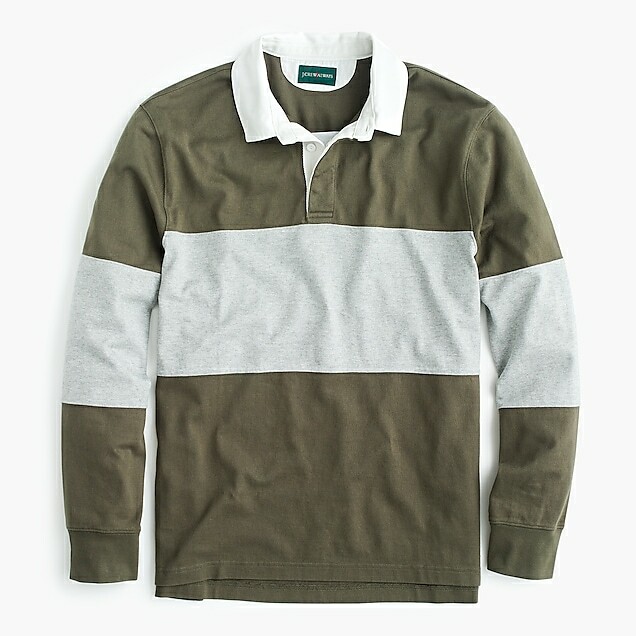 Drake’s has a U.S. made rugby in a less fitted cut (note the off the shoulder styling) for $275. And if you feel like spending over $500 on a cotton shirt, designer J.W. Anderson has you covered. And there’s always vintage. A lot of those 1980s rugbies are in very good shape and go cheap on Ebay and Etsy–there’s just so many of them. Look for Bean, Land’s End, Columbia Knit, Patagonia, Rugged Wear (this guy has some deadstock), or Umbro (Chouinard’s original choice), or fight Anthony for Benettons. A classic Benetton on Grailed.